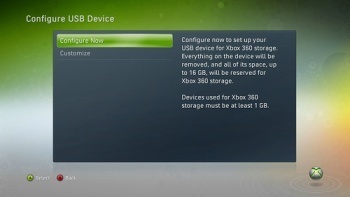 USB memory support will be coming to the Xbox 360 by way of a new system update scheduled for release in April. Microsoft's Larry Hryb, aka Major Nelson, revealed on his blog today that a system update scheduled for April 6 will enable USB memory support on the Xbox 360. Once the update is in place, 360 owners will be able to plug USB flash drives into their consoles, configure them via system settings and then use them to store profiles, game saves, demos and other information. Memory management functionality is also being updated to give users more control over data being copied or moved between devices. Individual drives will be limited to 16 GB of storage but two separate devices can be connected simultaneously, allowing for a maximum of 32 GB of storage. USB hard drives "may" work, according to the Major, but they'll still be limited to 16 GB of storage and won't perform nearly as well. "Since performance on flash based USB storage is usually better, I highly recommend using flash based instead of spinning media like a hard drive," he wrote. "It's just going to give you a MUCH better experience." Microsoft is partnering with SanDisk to release an Xbox 360 branded USB drive in May which will be preconfigured to work with the console, but any USB drive of at least 1 GB in size can be used. For more information, including screen shots of the new USB drive support in action, pop over to majornelson.com.